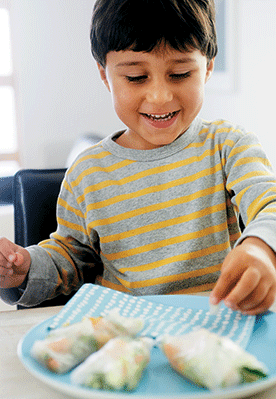 These wraps are a great way to introduce kids to some fresh, Asian-inspired flavours. 1. Prepare the rice wrappers according to the packet instructions. 2. Toss together all the remaining ingredients in a bowl. Divide the mixture evenly among the wrappers and roll up, ensuring the ends are tucked in. Serve straight away.